Go beyond four wheels and discover the many modes of exploring Tanzania's great outdoors. This eight-day tour is built for adventurous travellers who prefer a dose of adrenaline with their exploration. Canoe-safari through Momella Lake and spot hippos, giraffes, and water birds in their natural habitats, and hike into (and out of) an extinct volcanic crater. Of course, you'll have two days to explore the Serengeti in a 4x4, leaving your hands free for photo ops along the way (because it wouldn't be a trip to Tanzania without the safari photos to prove it). 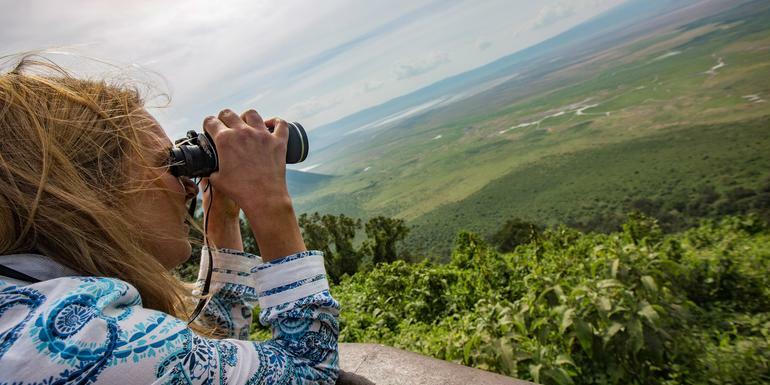 Cycle through Lake Manyara National Park, hike the Empakaai crater and spot flamingos, canoe along the shoreline of Momella Lake, learn about local tribes and their ways of life, safari through the Serengeti and Ngorongoro Crater and spot wildebeest and elephant. Simple hotels (2 nts), full-service camping (5 nts). Your G for Good Moment: Mto wa Mbu Village Visit and Lunch, Mto wa Mbu Your G for Good Moment: Clean Cookstove Project Visit, Mto wa Mbu. Canoe safari in Arusha National Park. Hike in Empakaai Crater. Wildlife safari drives in Serengeti National Park and Ngorongoro Crater. 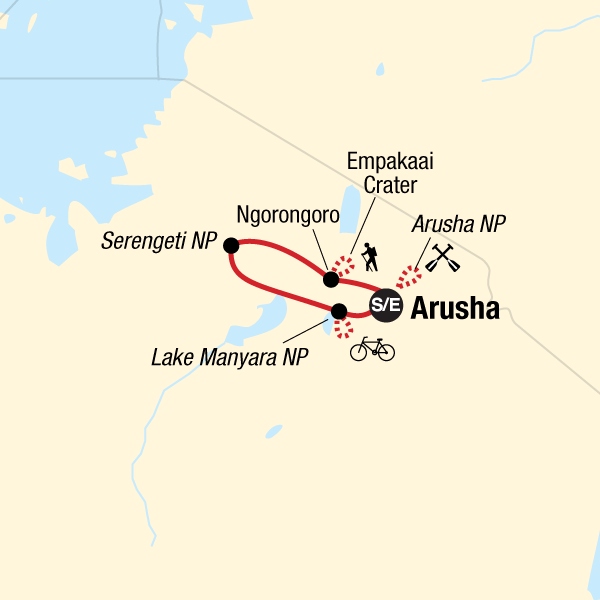 Mountain bike ride in Lake Manyara National Park. All transport between destinations and to/from included activities. G Adventures has been a world leader and innovator in sustainable adventure travel since 1990. We invite you to explore a world of tours infused with inspiration and excitement that will take you off the beaten track into the real heart of the destination. Our approach to travel provides small groups and independent travellers the rare opportunity to connect with nature and local cultures. The choices for travel are vast - from safaris and cultural treks to family vacations and exotic expeditions to places you have never even imagined, there is an adventure for everyone. If you share a lust of life and have the insatiable curiosity to travel and truly experience the world we live in, then join us and embark on a quest for the extraordinary. We are The Great Adventure People - welcome to our world of adventure travel!